NASA's Fermi Gamma-ray Space Telescope has unveiled a previously unseen structure centered in the Milky Way -- a finding likened in terms of scale to the discovery of a new continent on Earth. The feature, which spans 50,000 light-years, may be the remnant of an eruption from a supersized black hole at the center of our galaxy. "What we see are two gamma-ray-emitting bubbles that extend 25,000 light-years north and south of the galactic center," said Doug Finkbeiner, an astronomer at the Harvard-Smithsonian Center for Astrophysics (CfA) in Cambridge, Mass., who first recognized the feature. "We don't fully understand their nature or origin." At more than 100 degrees across, the structure spans more than half of the sky, from the constellation Virgo to the constellation Grus. It may be millions of years old. A paper on the findings will appear in an upcoming issue of The Astrophysical Journal. Finkbeiner and Harvard graduate students Meng Su and Tracy Slatyer revealed the bubbles by processing publicly available data from the satellite's Large Area Telescope (LAT). Their work expanded on previous studies led by Greg Dobler at the Kavli Institute for Theoretical Physics in Santa Barbara, Calif.
Fermi's Large Area Telescope is the most sensitive and highest-resolution gamma-ray detector ever orbited. 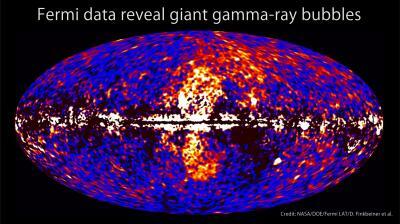 Gamma rays are the highest-energy form of light. The structures eluded previous astronomers studying gamma rays due in part to the so-called diffuse emission -- a fog of gamma rays that appears all over the sky. The emissions are caused by particles moving near the speed of light interacting with light and interstellar gas in the Milky Way. The Fermi LAT team is constantly refining models to uncover new gamma-ray sources obscured by the diffuse emission. By using various estimates of the gamma-ray fog, including the Fermi team's, Finkbeiner and his colleagues were able to subtract it from the LAT data and unveil the giant bubbles. "The LAT team confirmed the existence of an extended structure in the direction of the inner part of the Milky Way and we're in the process of performing a deeper analysis to better understand it," said Simona Murgia, a Fermi research associate at the SLAC National Accelerator Laboratory in Menlo Park, Calif. The researchers believe that an important process for producing the Milky Way's gamma-ray fog, called inverse Compton scattering, also lights up the bubbles. In that process, electrons moving near the speed of light collide with low-energy light, such as radio or infrared photons. The collision increases the energy of the photons into the gamma-ray part of the electromagnetic spectrum. 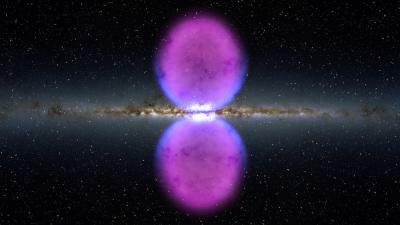 The bubble emissions are much more energetic than the gamma-ray fog seen elsewhere in the Milky Way. The bubbles also appear to have well-defined edges. Taken together, the structure's shape and emissions suggest that it was formed as a result of a large and relatively rapid energy release -- the source of which remains a mystery, Finkbeiner noted. One possibility includes a particle jet from the supermassive black hole at the galactic center. In many other galaxies, astronomers see fast particle jets powered by matter falling toward a central black hole. While there is no evidence that the Milky Way's black hole sports such a jet today, it may have in the past. The bubbles also may have formed as a result of gas outflows from a burst of star formation, perhaps the one that produced many massive star clusters in the Milky Way's central light-years several million years ago. "In other galaxies, we see that starbursts can drive enormous gas outflows," said David Spergel at Princeton University in New Jersey. "Whatever the energy source behind these huge bubbles may be, it is connected to many deep questions in astrophysics." Finkbeiner noted that, in retrospect, hints of the bubbles appear in earlier spacecraft data, including the Germany-led Roentgen X-ray Satellite (ROSAT) and NASA's Wilkinson Microwave Anisotropy Probe (WMAP).